The violence on behalf of the religion continue to occure in this beloved land of Indonesia. Since of the Bali bombing, the Marriott bombing, the conflict in Ambon, Maluku, Poso, the burning of a mosque in Papua and the latest event of burning several churches in Aceh. Thousands of people were injured, and hundreds of lives lost, become victims of the events of the violent tragedy. The violence, leaving trauma, fear and psychological disorders that are not easy to cure. Why 'religion' seems to be something inseparable with violence. Why religion is considered as an holy entity became the foundation for doing acts of violence and even loss of the lives of others. Is there anything wrong in the way we embodies religious life? How the role of religion which is more appropriate in the Indonesia context ? Based on the reflection, the writer try to dig, lift and try to compare two political role of religion: “the aspiration and inspiration”, and which one is more appropriate to the context of Indonesia and certainly more guarantee for a peaceful, just and prosperous for all Indonesian citizens. Bulton, G. Wayne.ed. From Christ to The World. Grand Rapids: Wm.B. Eerdmans, 1994. Darmaputra, Eka. Bukan Keterpisahan, Tapi Kemitraan” Etika Politik Dalam Konteks Indonesia. Yogyakarta: Kanisius, 2001. Gus Dur, Mengurai Hubungan Negara dan Agama. Jakarta: Grasindo, 1999. Haeurwas, Stanley, A Community of Character Toward a Constructive Christian Social Ethic. Notre Dame: University of Notre Dame Press, 1998. Moelyono, Anthon M, Kamus Besar Bahasa Indonesia. Jakarta: Balai Pustaka, 1990. Lefebure, D. Leo, Penyataan Allah, Agama dan Kekerasan. Jakarta: BPK Gunung Mulia, 2003. M, Norhalis. “Agama dan Kekerasan” dalam Newsletter Edisi Khusus: Agama dan kekerasan. Yogyakarta: Dian/Interfidei, 2003. Magnis Suseno, Franz. Etika Politik. Prinsip-prinsip Moral Dasar Kenegaraan Modern, Jakarta: Gramedia, 1987. Purwanto, Edi. Agama, Politik dan Negara: Perpektif Katolik, dalam Agama dan Negara. Ed. Th. Sumartana, dkk. Yogyakarta: Dian/Interfidei, 2002. Qodir, Zuly, Agama dalam bayang Bayang Kekuasaan, Yogyakarta: Dian/Interfidei, 2001. Susetyo, Benny, Vox Populi Vox Dei. 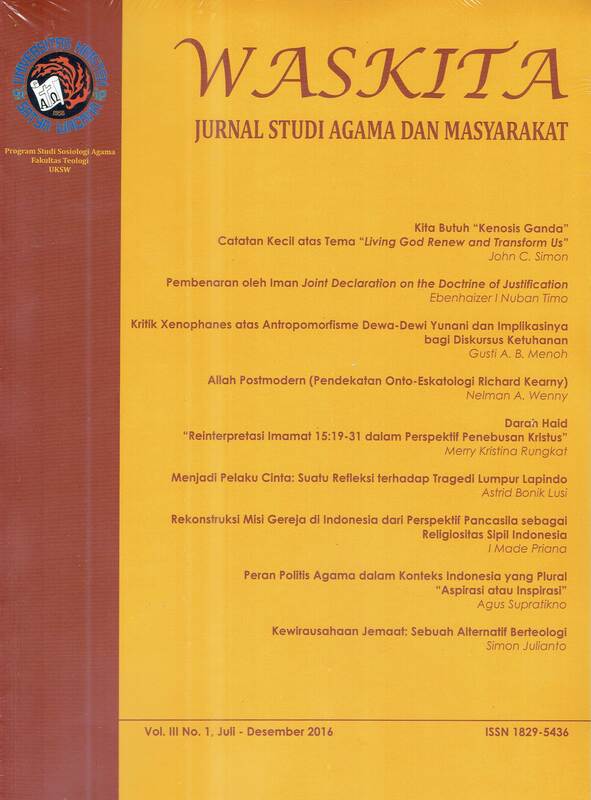 Malang: Averrous Press, 2004. Saputro, Eko, Memahami Wajah Para Pembela Tuhan, Yogyakarta: Dian/Interfidei, 2004. Stassen, Glenn. Just Peacemaking, Transforming Inisiative For Justice and Peace. Wesminters: John Knox Press, 1992. Suhadi, “Gejala Bergesernya Tembang Ilir-Ilir Menjadi Perda Syariat Islam” dalam Newsletter Edisi Khusus: Agama dan kekerasan, Yogyakarta: Dian/Interfidei. Walzer, Michael, Thick and Thin, Moral Argument At Home and Abroad, Notre Dame: University of Notre Dame Press, 1994. Yoder, John. H. The Politic of Jesus: Behold The Man! Our Victorius Man. Michigan: Eerdman Publishing, 1994).